Last month at EuroMedLab Thermo Fisher Scientific introduced a new liquid chromatography-tandem mass spectrometry (LC-MS/MS) platform aimed at the clinical lab space, the Cascadion Clinical Analyzer. The tool was specifically designed to fit within the workflow and turnaround times associated with hospital labs combining ease of use, with the proven sensitivity of LC-MS/MS. According to Robert DeWitte, vice president and general manager of mass spectrometry diagnostics at Thermo Fisher, Cascadion was developed over the course of the last six years to specifically meet the needs of hospital clinical labs, where quick sample-to-answer operation of clinical analyzers requires only minimal training. The reason hospitals resorted to having LC-MS systems run, essentially, as a separate island within the clinical diagnostics lab was because for a handful of tests, the existing immunoassays available weren’t accurate enough to give clinicians the specificity and selectivity they could get from mass spec. “In other words, they moved the gold-standard technology right into their lab,” DeWitte noted. Until recently, this seemed like the only solution, albeit one that was not broadly accessible to many hospitals since the skillset needed to run these systems were not what is found in a typical hospital setting. Thermo Fisher aims to change this paradigm with Cascadion. The system was completely designed and built from the ground up using Thermo Fisher products and technologies and is designed to be used by laboratory staff with no specialized LC-MS knowledge or in-depth training. 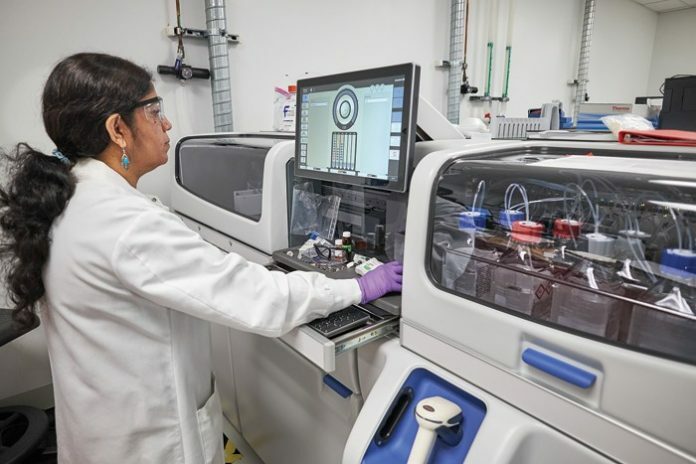 The automated system was also designed to be more on par with other clinical testing platforms that are standards-based for workflows and materials while allowing samples to be analyzed as they come into the lab. Current LC-MS use in the clinical lab is built around lab-developed tests, essentially each lab’s homebrew, resulting in a lack of standard protocols from lab to lab. In addition, its batch-directed workflows which often would have hospital labs running one batch per day on their mass spec platform—or even less frequently depending on their testing volume. While DeWitte wouldn’t detail specific turnaround times for Cascadion, he did say the platform is intended to provide the same kind of quick answers as other analytical tools found in a clinical lab. The platform is not currently available to new customers as Thermo Fisher is working toward receiving EU marketing approval for 2018, and FDA 501(k) clearance sometime after its CE-IVD mark. Assays under development for Cascadion include tests for Vitamin D, testosterone, and immunosuppressant drug monitoring.